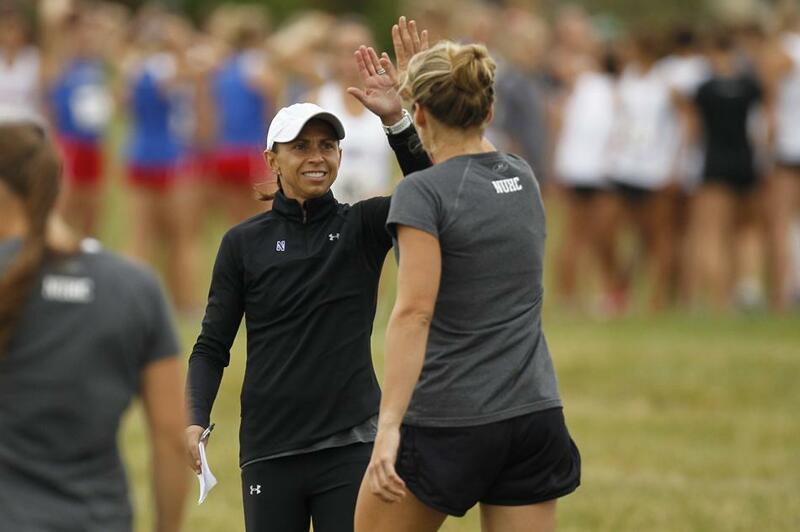 April Likhite took over Northwestern’s cross country program when it was resurrected in 1998 and coached the Wildcats until 2001. Then, after leaving for a few years, she returned in 2007. During both tenures, she has kept the program stable despite structural disadvantages. In late July 1987, Northwestern track and cross country athletes were notified that the school was completely dropping their sports. After the 1987-88 seasons, Northwestern became the only Big Ten school without men’s and women’s cross country and track programs. When NU decided to add another sport in 1998, it was decided that women’s cross country would be resurrected. But still, no men’s team and no track and field at all. At that time, coach April Likhite, then April Ecke, had just taken her first head coaching job at the University of Alabama at Birmingham. She had recently graduated from Mississippi State, where she ran cross country and track and was named Southeastern Conference Student-Athlete of the year in 1995. She also made the All-America cross country team in 1993 and was an All-SEC pick in 1992 and 1993. The reason Likhite continued her cross country career through coaching had a lot to do with chance. She got a scholarship to go to grad school at UAB, where an assistant coaching position opened up, so she got the opportunity to go to school and further pursue her running passion. While she coached at UAB, one of her coaching peers called her and told her NU was starting a women’s cross country program only, something Likhite had never heard of before. But she grew up in the Midwest and knew NU was a great school in a great conference, so she came all the way to Evanston for an interview and got the job. Likhite said it was initially overwhelming to resurrect only one aspect of a big program that had been completely dropped a decade earlier. She and the University were excited, though, because adding women’s cross country made a lot of sense. The sport usually draws strong, academically driven students and did not require additional facilities. By its third year back, the women’s cross country team finished fifth in the Big Ten. They just missed out on going to the NCAA Championships that year but had two women who were All-Big Ten and had one woman compete individually at nationals. Such quick success was a surprise for the new program, but Likhite said she knew she had the right athletes to make it happen. Assistant coach Patricia Tormey, who has been with NU for four seasons, said a big element of the runners’ attitudes comes from how Likhite inspires them. Tormey has finished her last season with the Cats and will be moving to California. She said she’s sad to be leaving behind the tight-knit family Likhite has built. Tormey said Likhite has become one of her best friends over the past few years, and it is not easy to leave the team behind. Many years ago, after that third season when the Cats placed fifth in the Big Ten Conference, Likhite faced a similar dilemma. She had just gotten engaged to her then-fiance Craig Likhite, whose job moved them to Michigan. Saying goodbye was the hardest decision of her life, she said, especially because the team was in such a dynamic position. She considered her collegiate coaching career over and moved on to high school teaching and coaching. Likhite had her son, Cade, in Michigan. Shortly after, however, the time was right once again for Likhite to find herself in the perfect coaching position. Her husband’s job moved her family back to Chicago, and right when she came back, the coach who had replaced her at NU was leaving. She got her job back. Likhite’s second time around at NU has come with many more challenges than she faced originally. The Big Ten Conference has become much more competitive, but more importantly, the Cats’ cross country only program now faces certain restrictions that other Big Ten programs do not face. During the team’s offseason (winter and spring), the players are not allowed to miss class. Other programs that have track and field programs, especially in the Midwest, travel to warmer climates to race, while NU is restricted to a few meets in the Chicago area. Likhite knows that the NCAA has the athletes’ best interest in mind. She doesn’t want her athletes to miss class, but she believes these rules don’t appropriately apply to her program like they do for others. NU is only allowed to travel during the traditional cross country season, while other schools reap the benefits of competition year-round because of their official track and field programs. No matter how much of a competitive edge the Cats might lose as they miss out on the big meets of indoor and outdoor track, they make up for it in other ways. Likhite’s main strength as a coach is her ability to build a solid, strong team culture that incorporates a hard work ethic, good leadership and team chemistry. A few years ago, Likhite decided not to have team captains on her team. Instead, she has built a leadership council with five women whom their teammates select to represent them, communicate well and genuinely adhere to the team’s philosophies. Junior Elena Barham is one of the members of the leadership council, and she said Likhite’s willingness to have an open dialogue with them is unique and productive. Instituting the leadership council reflects Likhite’s willingness to understand each individual’s needs, something Barham said is Likhite’s greatest coaching strength. Likhite has used her leadership and guidance to build a strong team despite intrinsic challenges the program faces, but she made it clear that the team has returned that favor to her, too. She said raising her 8-year-old son, Cade, in this kind of environment is an incredible opportunity. At the end of the day, Likhite said her life revolves mostly around her team and her son. Moving forward, she wants to continue to see her son affected by the positive influence of the women on her team and to foster a strong team culture that will bring the Cats a national championship.